Maybe too many oats in her diet! No Richard the horse has gotten into the whoopie pies, LOL. But seriously, I do find it interesting to see these pictures. Isn’t really awesome timing to be able to get a shot like that? Apparently this was the subject of one of the original motion picture films. This is a pacer! Pacersare wonderful driving horse for the Amish. They are beautiful to behold and very fast on the road! It is a type of gait and is usally learned by having a leg harness designed to achieve “the pace.” The horse moves both legs on ome side of the body at the same time, so that when the left side is forward the right side is back. They are beautiful to watch and a joy to drive. What a beautiful “flying” horse!!! This picture reminds me of the view from my friend’s living room in Lebanon! No Richard, not you but a friend that lives outside of town. I love visiting her and watching the buggies go by!! She lives on East Evergreen. What a beautiiful horse! Makes me want to hitch up my horse …hehe. For all you horse lovers and believers in magic, I can top you! How about that car on top of the buggy? I’m inclined to believe that for a second this horse is in fact off the ground. I think it all depends on when the photo is taken. I’ve never seen it, but has anyone seen a picture of a horse racing where all four feet are off the ground ahead and behind. Just curious. Another example of Amish thrift. You save a fortune on horseshoes when you train ’em to run like this. Ooh, ooh, ooh odd movie reference here, gang! It’s from the Amish related deleted scene from the Michael J. Fox film series “Back to the Future”, in addition to using hover-boards in the future Marty McFly also sees the Amish utilizing hover-horse-and-buggies, but doesn’t use one himself. If Im not mistaken, the horse will only have all four feet off the ground when moving at a canter or gallop, faster than a walk or a trot — wonder what that’d feel like behind a flat-out running horse, in a buggy or wagon! Being behind a trotting horse seems quite fast enough to me! *smiles* Beautiful picture that is to get the horse just at that split second! Here’s a link to another horse with all four feet off the ground. 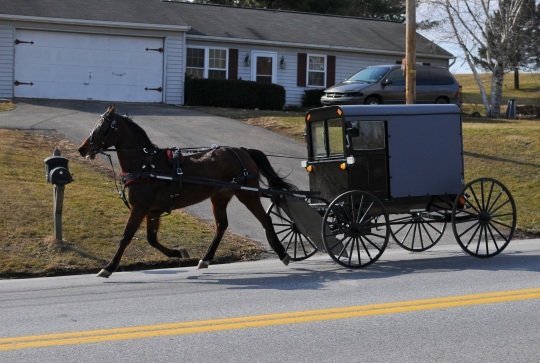 The legs of this horse have two feet pointing forward, the left front and right rear, while the left rear and right front point backward, same as in the photo at the top of this Amish America page. This is from the Buggy Races at Yoder Heritage Day in Kansas in 2009.